The president’s pattern of lying to himself—and to fellow Republicans—sustains bad policy and failed governance. Donald Trump is so out of touch with reality that he thinks he is popular. He’s not. And Americans, no matter what their partisanship, no matter what their ideology, should be worried that their president is lying not just to them but to himself. Trump has been obsessed in recent days by a Rasmussen Reports daily presidential tracking poll that was published April 4. It put his approval rating at 51 percent. “Still Rising: Rasmussen Poll Shows Donald Trump Approval Ratings Now at 51 Percent,” Trump tweeted on Wednesday, as part of a pattern of tweets claiming that he’s experiencing a popularity surge. The problem with Trump’s calculus is that, the “51” number was always an outlier. And it was already collapsing. Rasmussen, a polling firm that has consistently found higher numbers for Trump than other survey research operations, did put the president at 51 on Wednesday. 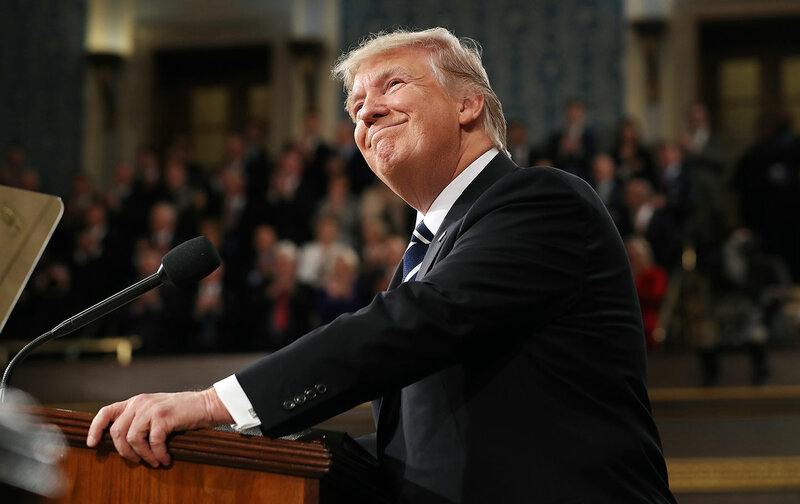 But Thursday’s Rasmussen daily tracking poll had the president’s approval rating falling to 47 percent, with 51 percent of those polled expressing disapproval. On Friday, when Trump was saying “it’s now 51,” his Rasmussen approval rating was actually 47 percent, while his disapproval number had risen to 52 percent. In other words, the survey firm that the president has been busy thanking for doing “honest polling” is telling us that his approval rating has gone down in a week that saw talk of a “trade war” with China and mounting calls for the removal of scandal-plagued Environmental Protection Agency chief Scott Pruitt. But it’s actually much worse than that for Trump. Rasmussen is just one pollster. All the rest of the recent polls from major survey research groups show Trump with a double-digit polling deficit. Some have his approval rating falling into the 30s. The Real Clear Politics average of recent polls provides the clearest picture: As of Friday morning, Trump’s approval rating was at 41.5 percent. His disapproval rating was at 54.6 percent. That’s a 13.1 percent deficit. That’s also well below the level of support Trump got when he lost—let’s reemphasize: lost—the popular vote in 2016. In that year’s presidential race, Trump secured 46.1 percent of the vote to 48.2 percent for Democrat Hillary Clinton. Clinton received almost 3 million more votes than Trump, and that was after she faced an onslaught of criticism and attacks during the 2016 campaign. Trump could never accept those numbers. He has made wild claims about voter fraud and promoted other electoral fantasies in attempts to explain his failure to appeal to the vast majority of voters. And he never acknowledges—no matter how his numbers compared with Clinton’s in the popular vote—that the overall portion of the 2016 American electorate that chose someone other than Trump for the presidency was 54 percent. Why should Americans worry that their president keeps deceiving himself—and his fellow Republicans, in Congress and in the states where GOP-backed candidates are being rejected with growing frequency—about these approval ratings? Because this is a president who, we are told, trusts his instincts. If Trump really believes his approach to governing is popular, if he really imagines that his popularity is “still rising,” he is more likely to keep doing what he is doing. The fact is that Trump’s instincts are wrong, as are his policies. They are not making him more popular. He may experience temporary fluctuations in his approval ratings, but they are never great—or even all that good. In fact, when it comes to approval ratings, it certainly looks like Trump’s best days were back in November of 2016, when he was on the losing end of a 54-46 measure of popular sentiment.